British Liberal Prime Minister (1895-1895). ALS. 1p. Lansdowne House. January 7th, 1883. To Mrs Stuart Wortley. "Many thanks for the letter which I return. I wish people wrote such letters now. 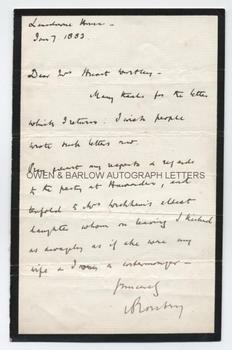 Pray present my respects and regards to the party at Hawarden, and tenfold to Mrs Wickham's eldest daughter whom on leaving I kicked as savagely as if she were my wife and I a costermonger." 8vo. Approx 7 x 4.5 inches. Mourning edge. Lacking integral blank leaf. Slight creasing, else near fine. Lord Rosebery was a supremely intelligent man who at an early age expressed three ambitions - to marry an heiress, to win the Derby and to become Prime Minister. Remarkably, he managed all three. He was politically astute and managed Gladstone's Midlothian Campaigns in 1879 and was rewarded with the post of Foreign Secretary in Gladstone's 1886 ministry. Hawarden (referred to in this letter) was Gladstone's house. Mrs Wickham was Agnes Wickham nee Gladstone, Gladstone's sister. Lord Rosebery appears to have accidentally kicked her daughter whilst visiting them - an incident which he here refers to in typically amusing style. The addressee of the letter is probably Alice Stuart-Wortley, daughter of the artist John Millais and wife of the Conservative M.P. Charles Stuart-Wortley. Alice Stuart-Wortley was a friend of Edward Elgar, who called her 'Windflower'.